Pointe Lorient, Acrylic on canvas, 35 x 28 x 1.75 in. Once used to describe the atmospheric work of J.M.W. Turner, ‘pictures of nothing’, reflects a common expectation that one see a recognizable image in a work of art. My work, on the other hand, is an attempt to abstract those images to generate an evocation of a place, experience or memory for the viewer. I usually work in series so you see colors and forms that play off each other or continuously develop particular ideas. In these works, long vertical forms are like a slice through an immersive experience. 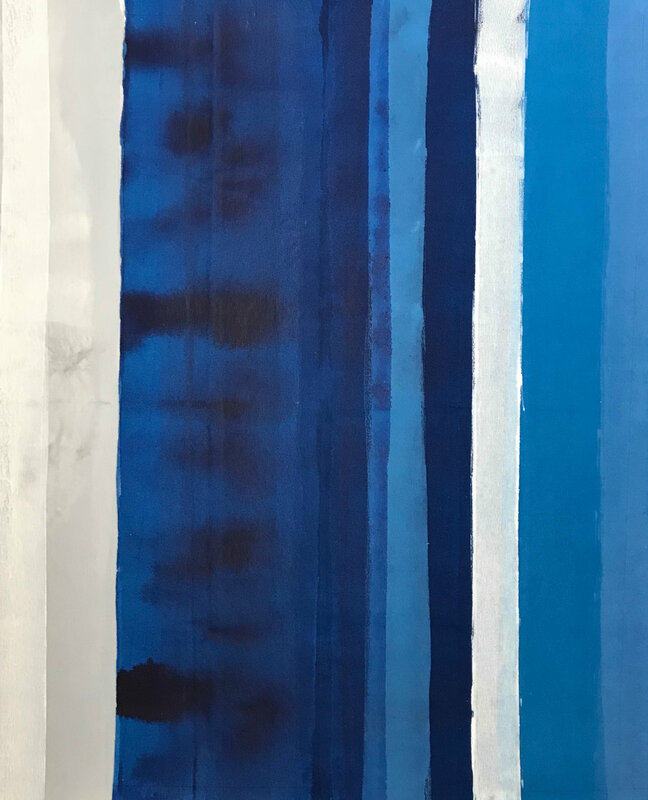 Working in acrylic and pouring multiple layers of thinned paint onto unprimed canvas allows the pigment to seep into the fabric to actually stain the canvas. The staining process creates a certain flow to the finished work. The same process produces similar results on paper. My work is about creating essays on places or memories. It is not about making pictures of something; it’s about defining the essence of space and experience. Anse de Petit Jean, Acrylic on canvas, 35 x 28 x 1.75 in.